The post has been shared by	552 people. The Sungrow Huainan Solar Farm was once the world’s largest floating solar array. Located 5 km southwest of Nihe Town, Huainan city in China’s Anhui province, the array floats on an artificial lake, created on the site of a former coal mine, and has a capacity of 40 MW. The array consists of 166,000 panels and was built by Sungrow Power Supply. 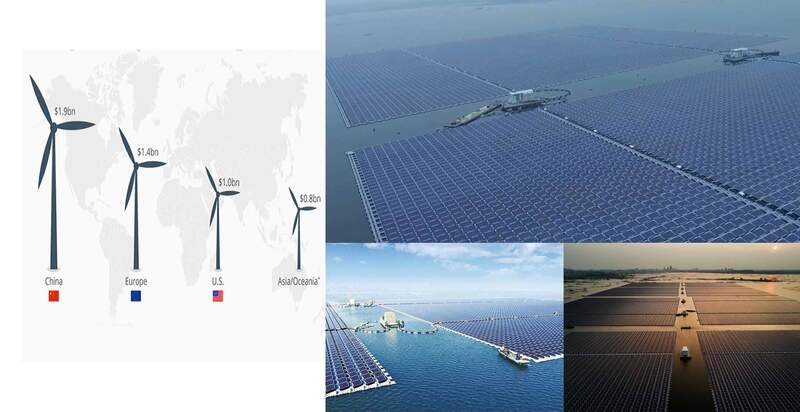 It produces enough energy to power 15,000 homes, or twice as much as the previous holder of the largest-floating-solar-plant title, which was built by Xinyi Solar nearby in 2016. The benefits of floating solar arrays include: lower temperatures boosting power efficiency; the lack of dust meaning it can stay clean longer; using the water to clean the panels; and reducing water evaporation. So why build solar plants on top of lakes and reservoirs? Fiona Harvey at The Guardian explains that building on bodies of water, especially man made lakes that are not ecologically sensitive, helps protect agricultural land and terrestrial ecosystems from being developed for energy use. The water also cools the electronics in the solar panels, helping them to work more efficiently, reports Alistair Boyle for The Telegraph. For similar reasons Britain built a 23,000-panel floating solar farm on the Queen Elizabeth II reservoir near Heathrow airport in 2016 to help power the Thames Water treatment plant.